I love your use of colors! Beautiful rendition of your subject Julie! Great mix of colors! 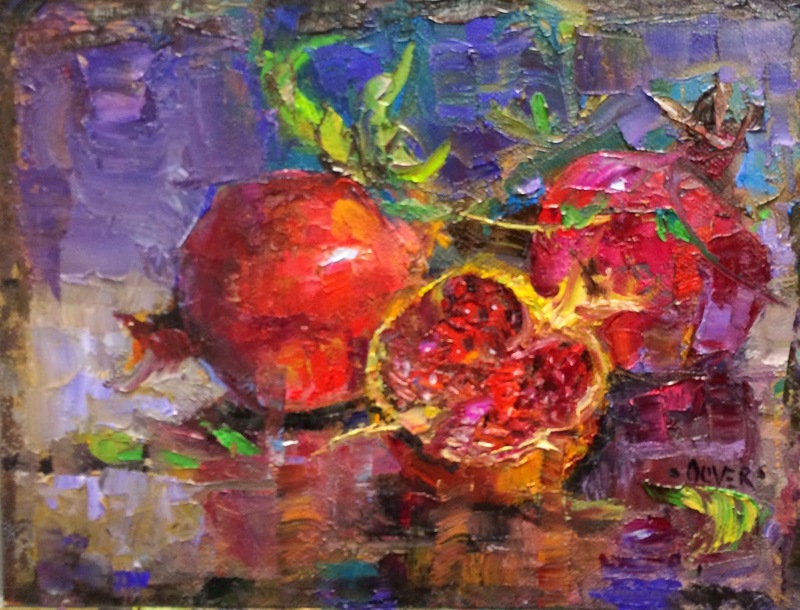 Very beautiful pomegranates painting !!! Something about reds, pinks, and oranges together that make the heart sing and dance. Funnily, not a combo I would have ever liked as a kid...My secret artist self is finally coming out to the forefront!!! This one is very special, Julie. Love the yummy color. Those gorgeous greens set everything off so beautifully! Gosh, what a color sense you have! This color is luscious! It makes my mouth water! Beautiful painting Julie! I've never tried this fruit...but understand it's very good! You continue to amaze, smiles. Another beauty. So Gorgeous! Thank you for sharing your gift. The best pomegranate painting I have ever enjoyed! I've always admired your work. I think this one is one of my favorites. Beautiful! Julie -- this is certainly breathtaking. The colors are rich and just pop off the canvas. Just so beautiful friend.